Of all the blog requests I’ve received, this one ranks among the trickiest to handle, because while it’s a general topic about which I know a fair few things (Mega Man), I’ve never paid much attention to his toy variants. 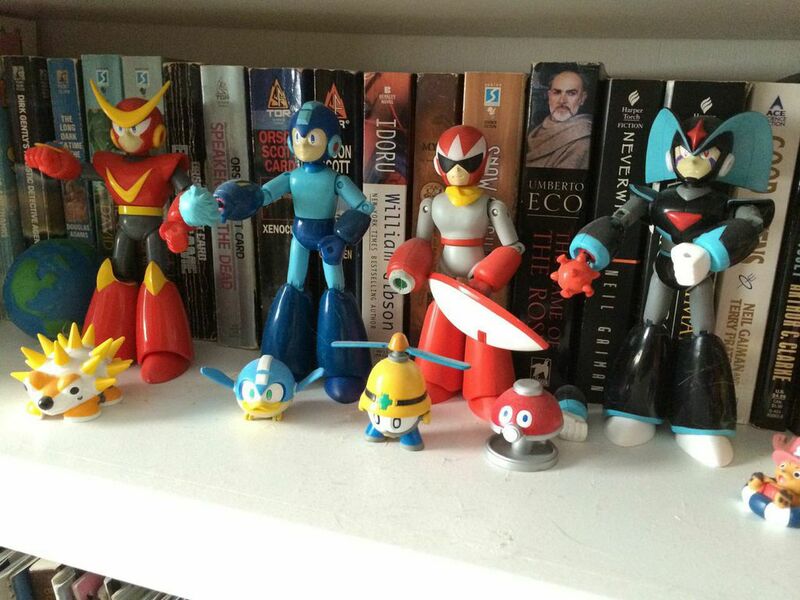 Mega Man has seen quite a few toys over the years! And I’ve ignored them. That’s because the early ones were entirely too lousy to bother with, and the more recent ones are entirely too expensive for their own good. Alas! For much of Mega Man’s history, the toys have been licensed to Bandai for design and production. This hasn’t been a universal truth, mind you, but by and large they’ve been the most prominent licensee. One assumes this gave Bandai the “in” for producing the absolutely terrible Rockman & Forte: Mirai Kara no Chousensha for WonderSwan, which only goes to prove that these toys are a scourge upon our race. Bandai’s first foray into the world of plastic Mega Men was, tragically, based on the Ruby-Spears cartoon. The result was a real double-whammy — early ’90s toy technology combined with the vomitous aesthetic choices of that terrible, terrible animated series. I do have to give the designers and manufacturers credit, though: These things are spot on. They’re a perfect interpretation of the cartoon designs. But this was maybe one of those times when perfection wasn’t entirely necessary. I sure don’t need to see Mega Man’s six-pack, that’s for sure. A decade later, Mega Man made an aggressive foray into toy marketing on the strength of the Battle Network/NT Warrior series. This actually made perfect sense: Not only was the series a hit with the kids, it also offered plenty of opportunities for mirroring in play patterns. Since protagonist Lan carried around a pre-tablet networked device called a P.E.T. for battling his virtual Mega Man avatar with friends and enemies like, it easily opened the door for “real” P.E.T.s that “real” kids could use to have “real” battles. They even came with battle chips, the same as in the games, that players could plug in and use in their battles. I don’t actually know how this thing worked, but I assume it was a fairly simple Barcode Battler-type thing with a splash of Tamagotchi. In Japan, there was a different P.E.T.-style toy released called the Battle Chip Gate which actually interfaced with the Game Boy Advance and allowed kids to augment their game with special battle data by purchasing specific chips. This was basically a more expensive take on the eReader, and it only tied in with a single reissued version of Mega Man Battle Network 4 (Rockman EXE 4.5 Real Operation). I feel like it probably wasn’t a coincidence that the series’ sales and popularity began to slide around this time. Even kids know when they’re being bilked. Ironically, the best Mega Man toys didn’t make it to market until right around the time Capcom started going around to all the different Mega Man games it had announced and putting a pillow over their faces as they slept. Bandai’s D-Arts and Figuarts series fall into the upmarket non-scale figure category forged by Figma and Revoltech, and honestly they may be the best of the entire bunch — though it helps that the exaggerated designs of the Mega Man characters being depicted lend themselves to figuration. Those massive feet and forearms really help obscure the joints, which tends to be a shortcoming for more realistically proportioned figures. The problem? These suckers are expensive. They start at $40 and go up from there. And most of the figures they’ve released have been different stupid armor variants of Mega Man X and Zero; no Mavericks or Robot Masters or even Roll or Dr. Wily. There’s a Sigma “figure” coming, but because Sigma’s so huge they just made him into a statue. Boo on that. Around the same time Bandai started churning out dozens of X armor variants, Kotobukiya took a similar premium tack by producing a small selection of Mega Man snap-together models. They’re kind of figures, kind of not. You made them yourself, and could interchange parts pretty easily, but being snap-together models they were terribly fragile. I bought three of them myself — Mega Man, Roll, and Protoman — and interestingly Roll was the most detailed of the bunch. She very nearly included sufficient parts for two full models, one in the “classic” sundress character style, another in the more detailed Mega Man 8 look. Ultimately, though, the figures’ insistence on falling to pieces (which wasn’t helped by the fact that I had them displayed on my desk at the IGN offices and they were like some kind of weird magnet for people to mess with) prompted me to pawn them off to get them out of my life. It was just too sad to come to work and see Mega Man standing there with his gun arm laying a few inches away. Bandai’s Mega Man Zero version of Zero. I figure there’s probably no harm in one. And I guess I could buy a classic Zero and pretend it’s the Zero/Omega battle that MMZ‘s spriters were too lazy to properly depict. But that’s where I call it a day. Now, if they start releasing Mega Man Legends figures, all bets are off. But something tells me we don’t have to worry about that. This entry was posted in Games, Toys and tagged mega man, taking time fundraiser, toys, Video games. Bookmark the permalink. I have no recollection where these guys came from. For cheapo figures, the sculpts and accessories aren’t terrible, though the painfully obvious joints are a bit flimsy – Proto Man isn’t drooping his shield like that on purpose. Those would be from the Jazwares line. Proto Man is from the terrible first wave, while the rest are from the better second. When I thought of this topic I had recently learned about the D-Arts figures, and wanted to get some of them, but could/can not justify spending that kind of money on them. I still have an MM8-era Blues snap-together toy (as seen in my forum avatar) that’s pretty decent, but not nearly as nice looking as those recent toys. It’s an “Ironbuster,” which means that one of the replacement arms is a giant buster that shoots out little plastic balls (which are silver, for some reason). I got an orange X toy around the same time, but I think I gave that one away at some point. I assume it came with a special weapon that would explain the color, but I can’t remember. Ray Splasher from X3, if memory serves. I’m going to go on record and say the Ruby-Spears cartoon is the most authentic take on the Mega Man universe there is. More entertaining than all the other Mega Man anime, comics, and even video games combined. A true classic for the ages, simply epic. Um, well, that’s certainly… something. You’re welcome to your opinion, and while I like the cartoon, I’m not sure “authentic” is the word you’re looking for here. Not “authentic”? Hmm… I guess the word I should be using is “canon”? Yes, that’s the one. The Ruby-Spears cartoon’s storyline and character interpretations are canon, everything else is just fanfic. No mention of Bandai’s snap together kits for MM8 and the X titles? They weren’t perfect, but they were the best things around for a LONG time. I doubt we’ll see a figure of Duo or Vajurilla FF (not any better known by his US name, Bit) again..